1. Loss of access to the “ultimate heat sink” (the river, sea or lake used for cooling). 2. Loss of all electrical power. 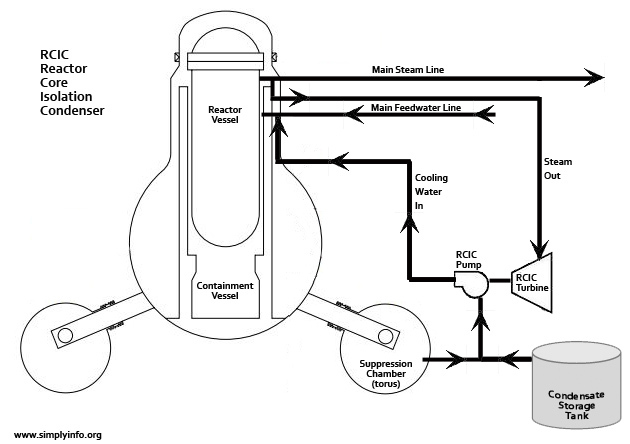 The RCIC has certain capabilities, It can provide make up water to the reactor when the reactor is shut off from the condenser in the turbine building that normally pulls heat out of the reactor cooling system. The RCIC can inject water at the rate of 2,000 Liters/min (600 gpm) even when the reactor is at a high pressure level. It can pump water into the RPV from full operating pressure down to ~1 MPa(150 psia). The RCIC can not lower reactor pressure. Pressure is relieved through the normal process of steam relief valves that route excess steam to the suppression chamber (torus). The RCIC can be deployed faster than the high pressure coolant injection system, taking only 30 seconds to take off after receiving an “on” signal. This system is capable of replacing water boiled off by the reactor and can compensate for small leaks. 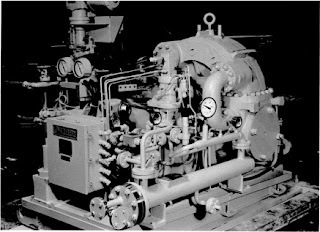 The RCIC operates by using a small steam turbine that is powered by the steam still being created by the heat in the reactor. The valves are used to maintain the correct water level in the reactor by turning the unit off and on. If the RCIC were to stay open and running it could potentially flood the reactor and send excess water back through the steam line that feeds the RCIC turbine. The RCIC can operate without electricity but the valves do require DC power from the plant battery system. This allows it to be started even in a total loss of AC power at the plant. The RCIC sends the steam it uses to turn the small turbine on to the suppression chamber (torus). The RCIC system pulls water first from the condensate storage tank located outside the reactor building and can alternatively pull water from the suppression chamber (torus). The condensate storage tank has between 200,000 and 375,000 gal capacity. Example of an RCIC turbine, more information about these pumps can be found on Peter Melzer’s blog.